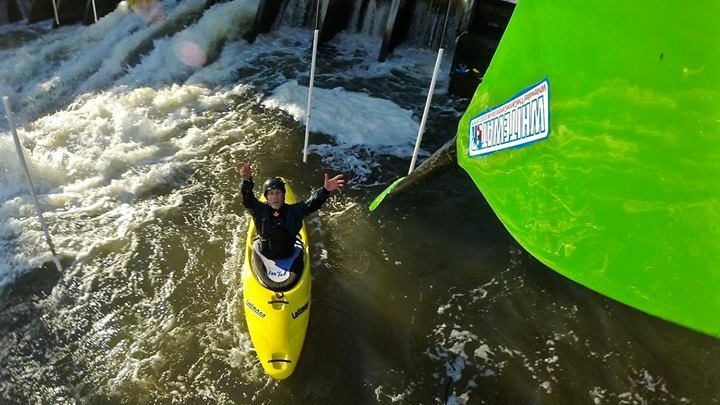 Being situated in Shepperton, within the confines of the M25, people often ask why we’re Whitewater the Canoe Centre – “Surely the nearest whitewater is hundreds of miles away?!”. 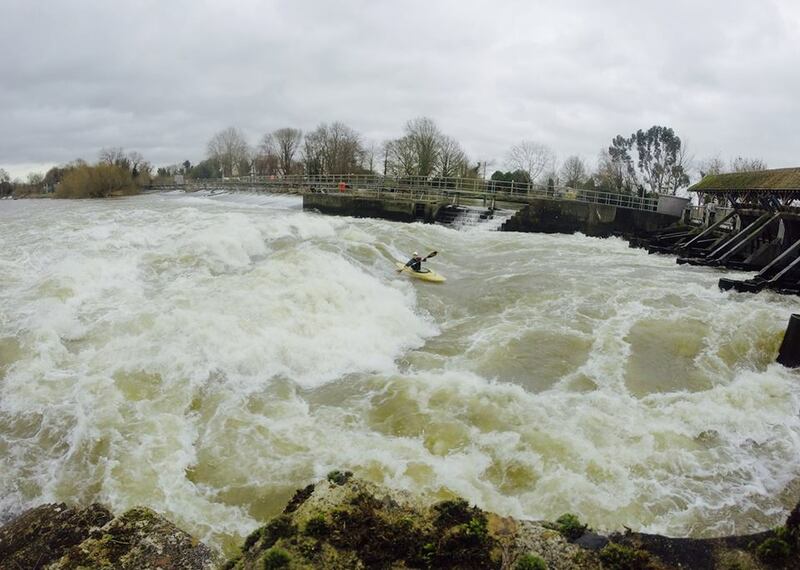 It nearly always surprises those new to the sport that the Thames is home to some of the best and burliest features in the UK, two of which are within 5 minutes of the shop door. 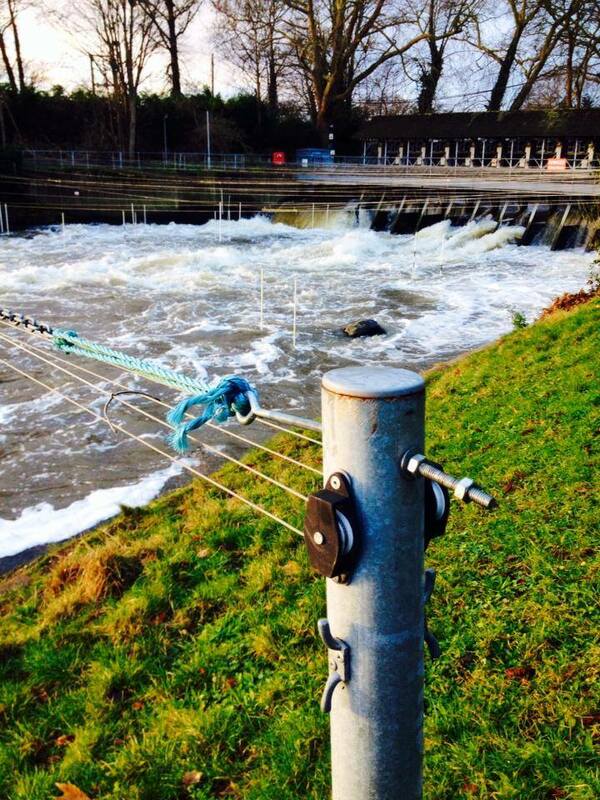 Sunbury Weir – Less than 5 minutes, by car, from the shop. Now describing the features on the Thames as burly may not be the best turn of phrase in a blog titled “Don’t fear the weir!” but I did also say it has some of the best. Weirs often get perceived as bad places which are dangerous and will try to eat you alive if you look at them wrong, but this just isn’t true. 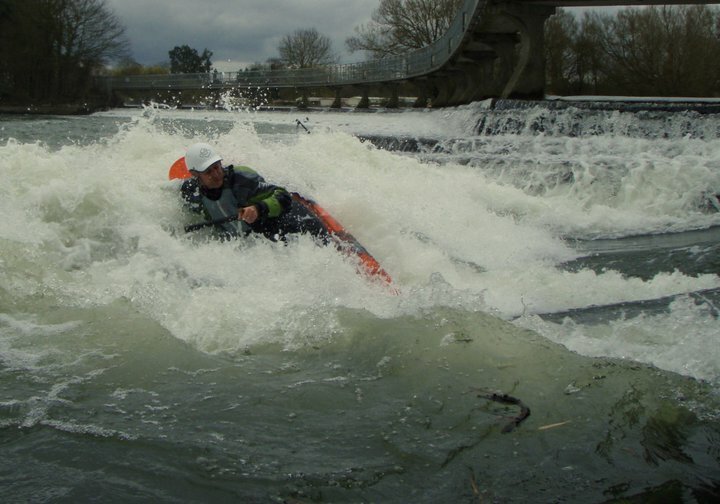 Weirs make fantastic training grounds with there nearly always being an option for every skill level. Shepperton Weir with 2 gates and both side spills open. While the main flow makes for a perfect training ground for the more confident, the side spills are an excellent venue to learn and practice breaking in and out. As the water level rises, so too (usually) does the difficulty. Late autumn into early winter, the gentler flow and smaller features make for excellent learning venues. A one gate Hurley or Shepperton with her side-spills open are ideal for practicing and refining break-outs, ferries and also your moving water roll. One of the great things about most of the weirs on the Thames is that they nearly always flow into a nice big pool (there are a few exceptions to this, most prominently Marsh weir). There is little to hit your body or head on when upside down, making going for that extra roll attempt even more worthwhile. 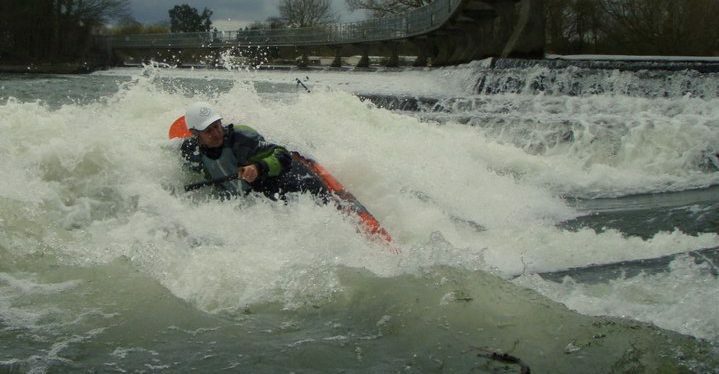 When I first started learning at Shepperton I would often capsize on the top feature and then wait upward of 30 seconds sometimes before rolling in the “calm” at the bottom or in an eddy. The fear of a boulder to the face just isn’t there. As with anything, the more you practice the stronger your roll will get and the amount of time you spend in the upside down position will get shorter. Plenty of space behind the main feature, stretching even further back than you can see in this photo. As the river gradually rises the weirs will become more open, resulting in more powerful features and flows. While this can seem intimidating at first, it is definitely worth persevering. Even if your goal isn’t to be able to play on the bigger features like many of the playboaters do, practicing controlled and accurate breakouts can be a load of fun in themselves, setting ferry challenges and using the slalom gates to improve your boat control. The eddy-lines and boils you experience at some of these weirs will be far stronger than those you experience at most natural river venues in the UK. One of my favourite things I was told during my formative paddling years was “if you can paddle Shepperton you can paddle anywhere”. While this should be taken with a pinch of salt, there’s a definite truth behind it. If you can learn, practice and refine the basics less than an hour from your front door I can guarantee you will get way more out of your next whitewater trip away. Get your creek boat out on the weir, a great way to stay familiar with the boat and you’ll probably get a bit more practice rolling it than normal which is no bad thing! One of the other benefit of weirs is being able to practice getting worked in a hole! Again, while this may sound horrendous, it is much more pleasant learning to control your boat in a hole or stopper in the friendly setting of Hurley than it is in the middle of a welsh ditch while making uncomfortable eye contact with a sheep. Plus once you get the hang of surfing and moving about the feature, you’ll probably end up being hooked on surfing. Even without doing any tricks, surfing a river wave is strangely addictive and feels just darn good. There’s nothing quite like a good ol’ soul surf to wind down at the end of a stressful day. The simple fact of the matter is that if you want to be the best whitewater paddler you can be you need to utilise what’s on your doorstep. While we may not have the delights of the Dart or the Conwy on ours, we do still have some excellent venues. 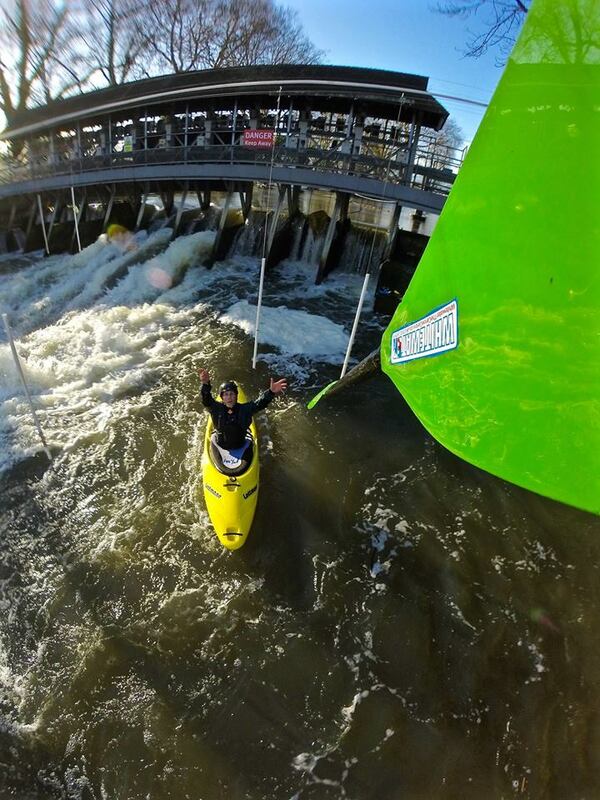 If you don’t paddle your local weir already you will be surprised how much you will improve! Before you know it you’ll be busting ends down at Hurley like it’s going out of fashion! For a more comprehensive guide of the well known Thames Weirs check out this site produced by Thames Valley Freestylers! One last thing, don’t feel like it’s only the big weirs that you can go to. There’s loads of fun little waves and features hidden up the back channels. For instance after a good healthy deluge of rain the River Wey can produce some excellent little surf waves just before it feeds the Thames. What makes going after some of these features up back channels so fun is that even if you live locally, you can never really be certain what you’re going to find! There’s no gauge to just look at on your phone and the nearest car park is a short paddle away! Just working your way up some of the back channels is a challenge in itself, making you eddie hop your way along and really charge some attainments. 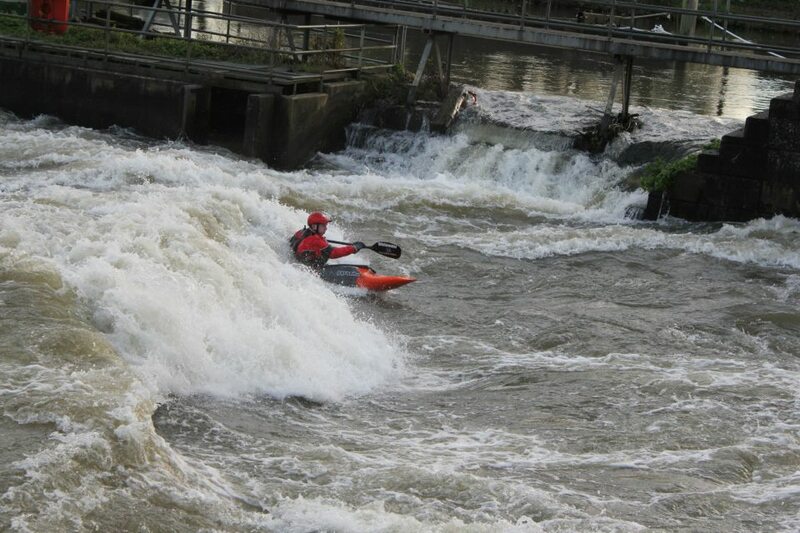 At the end of a slalom session charging up the Wey is a greater way to finish off the session (and your arms!) as you get a fun little surf at the end of it! Hopefully we’ll see you on the water soon! Next Warmth and Wicking – Get more from your thermals! Don’t Fear the Wier! But do respect it!